Bullmastiff Dogs - The Bullmastiff is a powerful dog, said to be a cross between the English Mastiff and the Bulldog. Originally bred to find and immobilise poachers, the breed has proved its value as a family pet. The Bullmastiff is courageous, loyal, calm, and loving with those it knows. It has a very strong protective instinct and will defend its people against anything it perceives as a threat. However, it does not normally attack to protect. Instead, it simply knocks the intruder over with its massive size and pins them to the ground, or, will simply stand in front of the stranger/intruder and refuse to let them pass. Bullmastiffs become intensely attached to their families and do best when they can live inside with their people. This information is licensed under the GNU Free Documentation License. It uses material from the Bullmastiff article on Wikipedia.org. 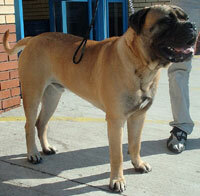 Bullmastiff Breeders - Advertise your kennel puppies and dogs here.